Top Tips - Skip the Line, Best Way to Visit, and More! Planning to visit the Rome Italy Colosseum? The Colosseum is one of the most amazing things you can see in Rome. Find out how to get the most out of your visit. Here's everything you need to know, from how to skip the line, when to go, which ticket to buy, what's included, and more. Big news! The rules about the Free Sunday have changed! The Colosseum is no longer free on the first Sunday of the month from and including April - September. Want to visit the underground, where gladiators, animals, and convicted criminals awaited their fate? How about visiting the top tiers of the Colosseum, where you can get a birds' eye view of Ancient Rome? On this page, I'll tell you everything you need to know to get the most out of your visit to this amazing monument. When is the colosseum open? When is the best time to visit the colosseum in Rome? How to avoid the crowds? How much does it cost to visit the Rome Colosseum? Are there any discounts? When is it free to visit the Rome Italy Colosseum? How to avoid the line at the coliseum? How to get colosseum tickets in advance? How long will it take to visit the Colosseum? 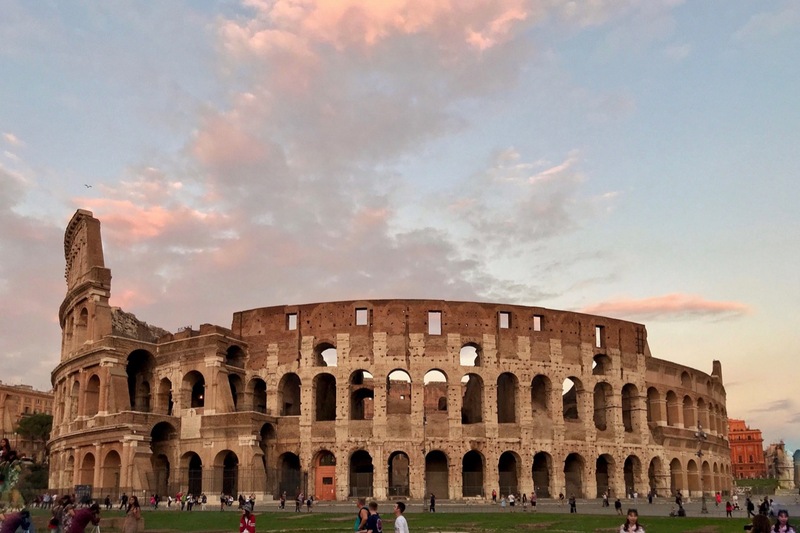 How long will it take to visit the Colosseum, Roman Forum, and Palatine Hill? How much time should you spend in each place? Which should you visit first? Should you take a tour of the Colosseum? How to visit the colosseum in Rome at night? How to visit underground coliseum? How to visit the upper tiers of the Rome colosseum? Where to eat near the colosseum? Is the Colosseum wheelchair accessible? Want to know about the history and architecture of the Colosseum? Here are some quick facts about the Roman colosseum. The Colosseum opens daily at 8:30am. If you come earlier, there is hardly anyone around and you can get photos like this. The colosseum opens at 8:30am, and closes “at sundown". This means in winter months, the Colosseum closes around 4:30pm (with last entry at 3:30pm). In the late spring and summer months it closes around 7pm. The ticket office closes one hour prior to closing time. For more specific closing times, visit the CoopCulture website, the official website of the Colosseum and other archeological sites. When is the best time to visit the colosseum in Rome? If you're wondering when is the best time to visit the Colosseum to avoid huge crowds, there are three parts to this answer - time of year, day of the week, and time of day. The Rome Italy Colosseum is one of the top attractions in Rome. Find out my tips for getting the most out of your visit. Best time of year to visit the Colosseum? The Rome Italy Colosseum is one of the city's top attractions, so it always has visitors. However, unlike the Vatican, it isn't crowded when tourists are not here. If you are here from March – October, a mix of high and mid seasons, the colosseum will pretty much always be crowded. If you come in low season (November, December, January, February), when there are fewer tourists, you will find it much less crowded. Especially on non-holiday weekdays. Best day of the week to visit the Colosseum? The Colosseum is open 7 days a week. It closes only December 25 and January 1. So is there a day of the week that is best for visiting the Colosseum? In high season, the Rome Italy Colosseum is crowded every day of the week. You can barely discern a difference between the crowds during the week vs. the weekend. But in low season, you will find the Colosseum much less crowded during the week than on the weekend. This is true even when it's Culture Week and entry is free. This is the line at the Rome Italy Colosseum on a February weekend. Yes, February is mostly low season. But is it busy at the Colosseum on the weekend? Even in low season? YES! On the weekends, you have Romans going around their city, with friends and family. You also have people who live near Rome and want to enjoy a day in the city. Then there are Italians and other European residents who find it easy to drive or fly into Rome on the weekend. So if you are one of these people, count on crowds at the Colosseum on weekends, even in low season. If you are here for Easter Weekend, the Colosseum closes early Friday, due to the Via Crucis. And on that weekend, it's open and will be packed. Best time of day to visit the Colosseum? Just about any time of year, high season or not, I always suggest visiting the Colosseum either when they first open at 8:30am, or, 1-2 hours before last entry. In high season, you will still see plenty of people at these hours but not nearly as many as during late morning and through the middle of the day. Think of the crowd amount as a bell curve. In hot months, you should avoid coming in the middle of the day, as there is virtually no shade and no place to sit down. The Colosseum closes at “sundown" so in the winter months, you’ll need to come earlier in the day. In low season months, from November through February (except for the Christmas and New Year holidays). At 8:30am when it first opens. Even in high season, you will still find crowds at this hour, but much smaller crowds than later in the day. One of my favorite times of day to visit the Colosseum is close to closing time. Then you can enjoy a bonus sunset as you leave. How Much Does it Cost to Visit the COlosseum? 2€ for Europeans between the ages of 18-25. At the moment, this discounted rate is available only to European citizens. If you book in advance, which allows you to skip the line, there is a 2€ fee. This is true even for free tickets. So for example, if you are eligible for a free ticket, i.e. if you are under 18, or have the Roma Pass or other City Pass, and you want to reserve a time so you can skip the line, you still need to pay the 2€ to reserve. You might be wondering why you still have to reserve a skip-the-line space if you have the Roma Pass (or other city pass) that allows you "free" entry to the Colosseum. Well, to manage the huge crowds that have just been getting bigger every year, the entity that manages the Colosseum, CoopCulture, have implemented new rules. As of March 1, 2019, visitors to the Colosseum, including Roma Pass holders, MUST reserve a time slot. And this means paying that 2€. If you don't reserve a time slot, you will have to wait until others with a reservation have gone in. And since there is an occupancy limit of 3000 people, in high season, you risk waiting a very long time to get in if you do not book a time slot. In fact, in high season, you risk not even getting in at all if you just turn up, especially late in the afternoon. What I find amazing is that for the price of entry to the Colosseum, you ALSO get to visit the Roman Forum and the Palatine Hill. The Roman Forum and Palatine Hill are included in your ticket to the Rome Italy Colosseum. These three places make up a huge area we call "Ancient Rome." The phrase Ancient Rome could really refer to a much larger area. You have 2 days to visit the Colosseum, Roman Forum, and Palatine Hill. The Roman Forum and Palatine Hill are actually ONE park, so you have to visit them together. You CAN visit everything in one day if you want. You can also take a lunch/coffee break between visits to the Colosseum and the Roman Forum/Palatine Hill. The entrance to the Roman Forum is on via dei Fori Imperiali, right where via Cavour meets it. The entrance to the Palatine Hill is past the huge arch of Constantine on Via di San Gregorio 30. If you don't purchase your tickets in advance, you can go to the entrance of the Roman Forum or Palatine Hill and buy the ticket there. NOT ANYMORE! FIND OUT ALL THE LATEST HERE! The only discounts available at this time are for Europeans between 18-25. The ticket costs 2€, plus 2€ to reserve a time slot. The Free Sunday Rule Has Changed! The Colosseum is NO LONGER FREE every first Sunday of the month! In 2019, the rules have changed. The first Sunday of April - September inclusive, the first Sunday of the month is not the Free Sunday. You will pay normally for all state sites and museums in Rome. How To avoid the line at the coliseum? How to get tickets in advance? One excellent way to skip the lines to the Rome Italy Colosseum is with the Roma Pass. Get the Roma Pass, or another type of Rome City Pass (they all offer skip-the-line entry to the Colosseum). I don’t actually recommend this as the best money-saving deal. But it does allow you entry to the Colosseum without waiting in the line to buy tickets. If you have a Roma Pass, you can skip the longer line, and go to the much shorter line for Roma Pass holders. You can book a tour of the Colosseum. When you book a tour, the tour guide/company takes care of getting the tickets for you, and of course you skip the line. You can pre-purchase tickets on the CoopCulturewebsite, the official concessioners for the Superintendence for Archaeological Heritage of Rome (Beniculturali di Roma). As I mentioned above, you can purchase your tickets at the entry to the Roman Forum or Palatine Hill. It's no longer the case that you can count on coming to the Palatine Hill to buy your tickets with no line. Now, they run out of tickets, and in high season, you might find yourself out of luck. If you did not get tickets in advance, and are just coming to the Colosseum and hoping to buy tickets, you can TRY to come to the Roman Forum or Palatine Hill entrances (in hopes of finding a shorter line), but you should come in the morning. The rules have changed! If you want to buy your tickets to the Colosseum without booking ahead, and are hoping to use the Palatine Hill entrance to avoid the line, you will need to come early in the day. By around lunchtime (depending on the season), these offices RUN OUT OF TICKETS! How long will it take to visit the Colosseum? I find that a typical visit to the inside of the colosseum, including walking around the two tiers you can visit with a standard ticket, takes around an hour. Of course you could spend less time if you want. But an hour is about right if you visit it as most people do, walking all the way around one tier, and then all the way around the other tier, and especially stopping to take pictures. There is often a special exhibit on the second-level tier, so if you spend time there, add anywhere from 10-30 minutes. Finally, there is a gift shop, so you might spend time there, as well. How long will it take to visit the Colosseum, Forum, and Palatine Hill? Typically, you will spend about an hour at each site, so a visit to "Ancient Rome", i.e. the Colosseum, Roman Forum, and Palatine Hill will take about 3 hours. Again, you can break this up, and visit over a full day, with a lunch break in between, or even over two days. For example, you could visit the Colosseum in the morning, break for lunch, and then head to the Forum/Palatine Hill after lunch or the next day. Most tours given by tour agencies of the Colosseum include the Roman Forum and the Palatine Hill, and last around 3-4 hours. Is it worth taking a tour of the Colosseum? I am a big fan of tours, especially to a place like Ancient Rome that is so full of history. Without a tour, you would need a really good guidebook, or audio tour, otherwise, you will just be looking at a bunch of ruins without any context ur understanding of where they came from and why they are there. If you are not a tour person, you could take the audio guide at each location. Just know that each site has its own audio guide. The Colosseum has one, the Roman Forum has another one, and the Palatine Hill has yet another one. When you book a ticket to the Colosseum on CoopCulture, one of the options is to book a tour. This is a tour given by the guides employed by the Colosseum. The cost is minimal (only 5€ more than a standard ticket). So it can be worthwhile to take this tour. You will certainly get some history and a good start towards your unaccompanied visit to the Roman Forum/Palatine Hill. Tour companies offer a more complete package. When you take a tour of the Colosseum with CoopCulture, you will get a basic tour of the Colosseum. Most tour companies include the Roman Forum/Palatine Hill at the very least, if not other special things to see along the way. Wondering where the bathrooms are at the Colosseum? Yes! Now, most of the year, you can visit the Colosseum at night. A night visit to the Colosseum is a very special thing to do and I cannot recommend it highly enough. The first time I visited the Rome Italy Colosseum, I thought, where is the floor? It turns out that since it was made of wood, it’s long gone, and now, the underneath is exposed. What went on under there? When you see the inside of the Rome Italy Colosseumn, you realize there is no floor. You can see underneath from here, but you can also go down there! When you visit the Rome Italy colosseum, think about this while looking at the labyrinth of chambers and passageways of what was once below the floor. For more facts about the Colosseum, visit this page. If you’d like to know more about the floor of the ancient Roman colosseum and what went on under there, you might want to read this fascinating writeup in the Smithsonian magazine. You may purchase tickets through CoopCulture. They have the exclusive right to tickets for Underground Colosseum. However, they do give a certain number of tickets to a select number of tour agencies, so you may also be able to go with one of these agencies on an underground tour of the colosseum. You can also look straight down on the entire Colosseum, and imagine what it was like to watch a game there (if you were a common woman or slave, you sat the the top). View of the Rome Italy Colosseum from the top tier, or Belvedere. You can book this on the CoopCulture website, or with a tour agency. For more about Colosseum tickets, visit my page here. Yes, the Rome Italy Colosseum is wheelchair accessible, mostly. The ground floor of the colosseum is accessible to wheelchair users. From there, you can take a lift/elevator to the second tier. You can also get around both the ground floor and second floor tiers in a wheelchair. Visits to the underground and upper tiers are not wheelchair accessible. You may bring your own wheelchair, or request one upon arrival. They only have one wheelchair available on each floor, so don't count on one being available. If you need your own, you should bring it, or rent one in Rome. Visitors who are disabled (with written medical proof, if not in a wheelchair), and their companion/caregiver, may enter the Colosseum/Roman Forum/Palatine Hill for free. If you would like more information about the colosseum in Rome, and the history of the colosseum, visit the official Rome website for the Superintendence for Archaeological Heritage of Rome.